Our 3-star campground is perfect for fans of camping. All of our pitches are divided, spacious and green for your privacy. 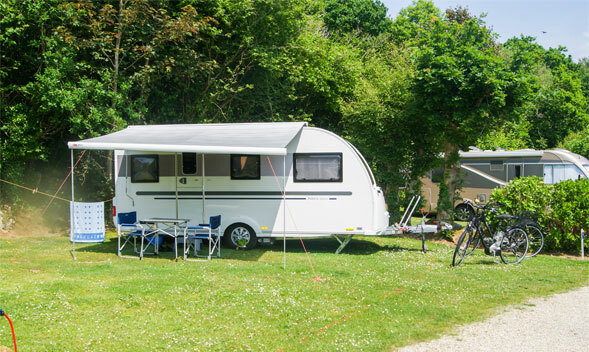 Whether you are in a tent, trailer or camper, we are happy to have you at the Kerleyou Campsite in Douarnenez. When you rent a camping pitch, you can check in on any day and stay as long as you wish. We offer sunny, half-shaded or shaded pitches, and we will do our best to meet your needs. Our sanitary block is equipped with everything you need and is accessible to people with limited mobility. You can also borrow a baby kit (changing table, bath tub…) upon request and subject to availability. Pets are allowed at the camping pitches, one pet per pitch (leashed and vaccinations up to date, 1st and 2nd category dogs prohibited). Our 4-legged friends must do their business outside the campsite, you can access the ISIS woods via the blue gate near the Kerleyou Campsite’s sanitary block.